One of the tragic stories from Everest 2017 was of Dawa Sange Sherpa who had all of his fingers severely frostbitten while working with a member who reportedly refused to turn back in bad weather. 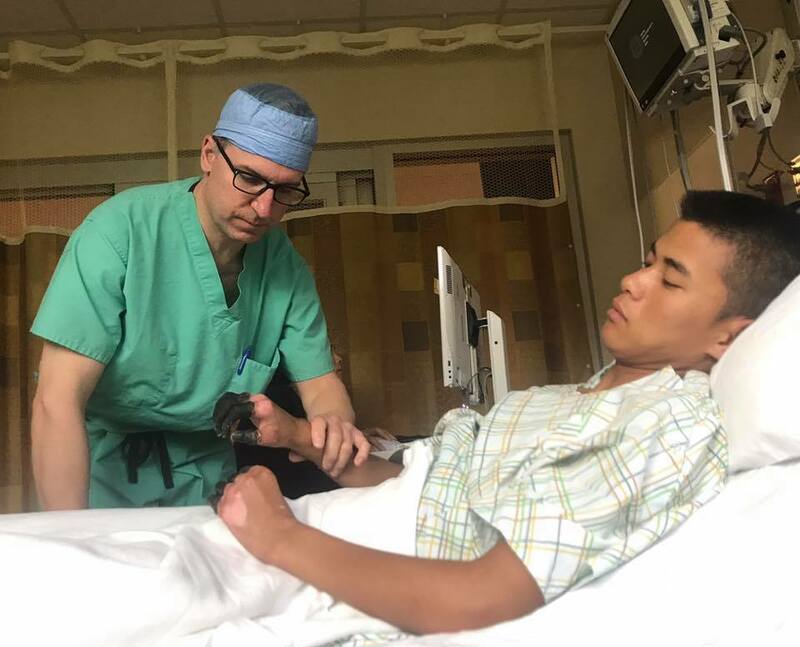 Thanks to the generosity of the climbing community, Sange is now in Vail, Colorado receiving treatment from some of the world’s best doctors but he needs our help. David Snow was trekking to Everest Base Camp with his group from Utah. Sange was guiding them on the trek and on to attempt Lobuche Peak. David found the young Sherpa eager to help his members, happy and healthy. They were impressed and optimistic for his future as a mountain guide, following in the footsteps of his father and uncle who guided on Everest. This was Sange’s first year as a full guide. Sange has a very tough road ahead. Finding employment and companionship will be extremely difficult or even impossible in Nepal. Sange will be receiving reconstructive treatment with Dr. Randall Viola through the Kees Brenninkmeyer Foundation. Dr. Randall Viola is considered a top surgeon in the field and he is currently the Head Team Physician for Men’s US Alpine Ski Team. The Kees Brenninkmeyer Foundation, with the Core Mission to financially assist alpine guides, patrollers, or instructors who require surgery in order to continue their careers, has agreed provide financial help for all of Sange’s surgeries and rehabilitations. This will be a long and hard process and we ask for your support in helping us help a young man who gave so much to others. Sange would not abandon his member–we won’t abandon Sange. A little background on how Sange got in this spot. Dawa Sange Sherpa was guiding Pakistani Col Abdul Jabbar Bhatti on the Nepal side of Everest on 21st May 2017. Both were feeling good when Sange swapped out Bhatti’s oxygen bottles at the Balcony – normal procedure. Sange had chosen not use supplemental oxygen on the ascent, saving it for the descent – a mistake on his part. As they made their way towards the summit from the South Summit, the weather turned for the worse. It was very bad. Strong winds and snow froze their masks, goggles and oxygen supply. They were in trouble. Young Sange repeatedly asked his member to to turn back but the Colonel refused citing how much he had paid, according to Sange. Senior guides monitoring their situation by walkie-talkie told Sange to turn back, even if it’s just himself, when they learned the member repeatedly refused, but again, Sange decided to stay with his member. They continued climbing and eventually reached the summit at 3 pm, after 18 hours of slow climbing from Camp 4 at the South Col.
Now both Sange and the Colonel were in desperate trouble. They had been climbing for over 18 hours. Sange gave his member another new oxygen bottle and they left after staying on the summit for only 5 minutes. As they descended, both climbers began to lose the will to live. My member was was walking very slowly and I was also doing good climbing down without use of oxygen. It became dark and we had to stop after a long descend. When I looked for my member he was resting on the ridge just few meters away from me. I called him a lot but he didn’t respond me at all. By now he was unconscious and too weak to walk and speak so do I. I inhaled my oxygen and I was too tired and unconscious that I didn’t realized when I went into sleep. Luckily I was awaken by the noise of other climbers, otherwise the climbers walking nearby would have considered me dead and left there. When I opened my eyes, I found myself lying unconscious. If I look around, it was just bright white ice and snow. It was just burning my eyes.There were many climbers going to the summit. I was feeling very hungry and thirsty, my water bottle was frozen and no matter how hard I tried I was not able to move my hand and body at all, there was no sense in my both hand. Soon I realized my hand were completely frost bitten, I was very hopeless and tired that I could have easily closed my eyes and become a permanent member of the mountain. It would have been very peaceful than suffering. About to die that day in the snow just below the summit of Mt. Everest, Sange relaxed and prepared to let go. But then Ang Tshering Lama, Nima Galzen Sherpa, Jangbu Ang Mingma Chhiri Sherpa and Pema Chirring Sherpa all with Sherpa Khangri Outdoor came upon the two climbers for the second time. The pair had been seen by other Sherpas who had advised them to descend but obviously they had not. Now they were found in tragic conditions. Led by Ang Tshering Lama who is a certified Wilderness First Responder and has volunteered as a search and rescue climbing ranger on Rainier and Denali the Sherpas acted quickly. After great effort the Sherpas got both to the lower camps where they were evacuated to Kathmandu. This video shows part of the rescue. Sange was admitted to Norvic Hospital in Kathmandu, which had no experience in treating frostbite patients. There he was essentially waiting for all his fingers to get amputated. However, Karsang Sherpa, who lives in Denver, Colorado, heard of Sange’s plight and went into action. 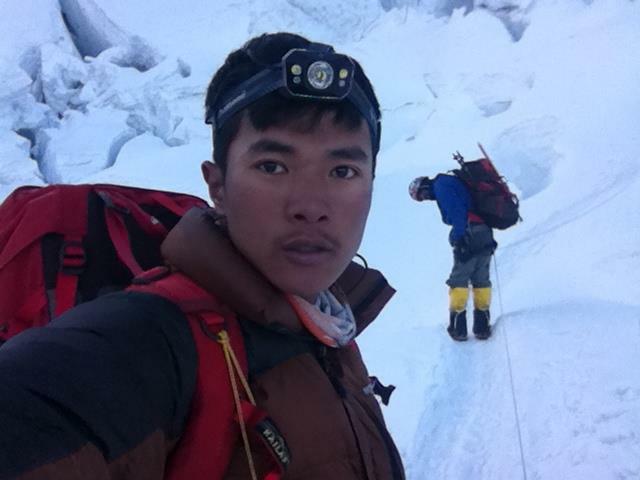 Two months ago, while researching for an article, I reached out to Sange to ask for details on his rescue off Everest. Well, Sange told me then that he was at Norvic Hospital, with his conditions getting worse, and doctors telling him that they were going to cut off all his ten fingers. I just couldn’t bear the thought of a 21-year old mountain guide losing all his fingers. Wishing and hoping then that somehow Sange could come over to the US and undergo reconstruction surgeries on his hands, I immediately reached out to my friends. Karsang contacted the Kees Brenninkmeyer Foundation, a non-profit resource for alpine industry professionals seeking orthopedic medical care in order to continue their careers. The foundation board approved financial support for Sange to undergo 3 reconstructive surgeries by one of the best in the world, Dr. Randall Viola of Steadman Clinic in Vail, Colorado. Sange just underwent the first surgery and will be spending at least three months in the Vail Valley, and Front Range, while undergoing three rounds of surgeries. He will be staying with a host family in Gypsum, Colorado (outside of Vail). Kees Brenninkmeyer Foundation: Thank you so much for your incredible generosity in helping Sange with all his treatments, and even providing his travel and boarding expenses. 2. Host Sange for a weekend or a couple of days while he’s in Colorado to help his host family during this time. i hope he is ok. This is a very sad situation for someone so young. It pisses me off that his ignorant A hole member hasn’t bothered to find out if he is ok? How in Gods name can he be labeled a hero? I don’t think people know the meaning of the word if that is the case. This bothered me the first time I read it & it pisses me off even more now!!!!!! Thanks for this amazing story. Shared and of course donated.